In any software application, sending and receiving electronic messages, more specifically e-mails are an essential part. Emails are a medium of communication between different parties who are using the application. 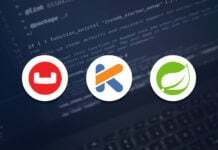 In most of the standard programming languages, emails APIs are available for communication, and Java is also not an exception. 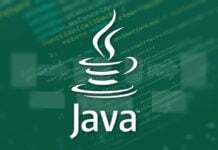 Java provides e-mail APIs which are platform and protocol independent. The mail management framework consists of various abstract classes for defining an e-mail communication system. In this article, we will discuss about the Java E-mail management framework and its important components. We will also work with some coding examples. 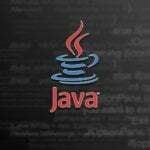 Java mail API comes as a default package with Java EE platform, and it is optional for Java SE platform. Java mail framework is composed of multiple components. 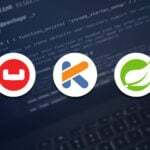 JavaMail API is one such component used by the developers to build mail applications. But, these APIs are just a layer between the Java application (mail enabled) and the protocol service providers. 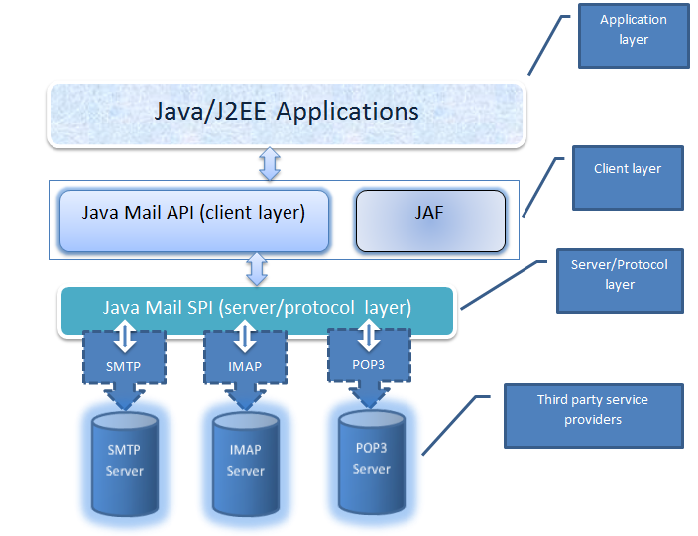 Let us have a look at different layers of Java mail architecture. Java Mail APIs: These are the Java interfaces to send and receive e-mails. This layer is completely independent of the underlying protocols. JavaBeans Activation Framework (JAF): This framework is used to manage mail contents like URL, attachments, mail extensions etc. Service Provider Interfaces: This layer sits between the protocol implementers and the Java applications, more specifically Java mail APIs. SPIs understand the protocol languages and hence create the bridge between the two sides. Service protocol implementers: These are the third party service providers who implements different protocols like SMTP, POP3 and IMAP etc. In this context we must have some ideas on the following protocols. SMTP – Simple Mail Transfer Protocol is used for sending e-mails. POP3 – Post Office Protocol is used to receive e-mails. It provides one to one mapping for users and mail boxes, which is one mail box for one user. IMAP – Internet Message Access Protocol is also used to receive e-mails. It supports multiple mail boxes for single user. MIME – Multipurpose Internet Mail Extensions is a protocol to define the transferred content. Following is the Java mail architecture diagram. There are mainly four layers in the system. The top layer is the Java application layer. The second layer is the client API layer along with JAF. Third layer contains server and protocol implementers. And, the bottom layer is the third party service providers. Before we start working on the code examples, let us complete the environment setup first. 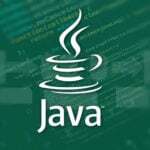 For Java mails, we need to download some JAR files and add them in the CLASSPATH. Following are the two which needs to be installed in your system. Now the environment setup is complete and we will jump into the coding part. How to send and receive e-mails? In our first example we will check how an email can be sent by using Java mail API and SMTP server. Following are the steps to be followed. Setup ‘From’ and ‘To’ address along with the user id and password. Send the message by using Transport object. Following listing followed the above steps. //Declare recipient's & sender's e-mail id. After compilation and running the application you will get the following output. Now in the second example we will check how to receive emails by using Java Mail APIs. Following code sample follows the steps described above. After compiling and running the application you will get the email number, sender details, mail content etc. Mail communication is a very common feature in any software application. 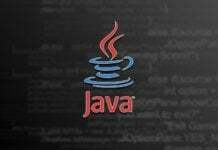 In this article we have discussed the mailing part defined in Java platform. 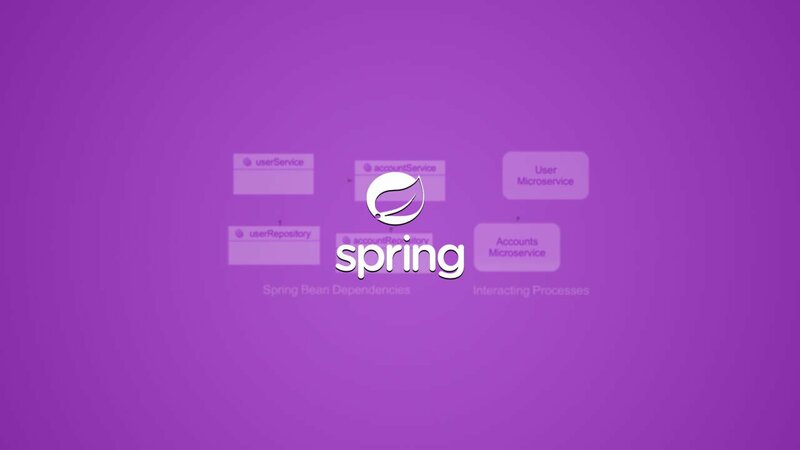 Java has a complete packages consisting of APIs for building email enabled application. But, along with this API layer, third party service providers are also an integral part of Java mailing system. We have also touched a little bit on the architecture side to get an idea how it world internally. And, finally we have worked with two coding examples to demonstrate sending and receiving emails. Hope this tutorial will help you understand Java mailing system in a better way. Your article is great tutorial for me and other users. But your tutorial is really amazing and informative. I would say you’ve done a great job with this. Could you please post the code snipper for office365 mail. Hello sir can you post a code which receive only unread recent mail with attachment. because through the above code i am getting all mails and attachment which is available in existing mail. hi… anyone get through reading mail for office365 ?